JOIN US AND SHOW YOUR ZEBRA PRIDE! 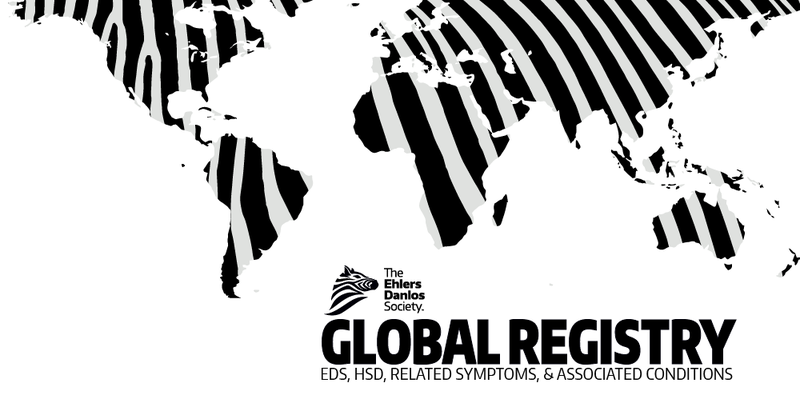 Join the EDS/HSD Global Registry and help researchers throughout the world to advance our understanding of EDS, HSD, and related symptoms and conditions! Map the experiences of those living with Ehlers-Danlos syndromes (EDS) and related disorders globally. Enable the gene search for hypermobile EDS and hypermobility spectrum disorders. Facilitate research into the frequency of related symptoms and conditions, which may be associated with the various types of EDS and HSD. Discover new forms of EDS/HSD. Understand the relationships between EDS/HSD and chronic pain, anxiety, and other problems such as neurological, mast cell, gastrointestinal, autonomic disorders. Participation is free to all, with global access available—no matter where you live—and more languages available soon. REGISTER TODAY! The Registry is GDPR and HIPAA compliant and easy to use! When you’re done, show your stripes with our official profile picture zebra frame! How do I register with EDS Registry? To register, click on the “SIGN UP/ SIGN IN” button on this page. You’ll be asked to provide an email address, and to choose a username and password, a set of security questions, and a site key. Once you’ve provided this information and accepted the Private Access End User License Agreement, you’ll be able to proceed with enrolling in the registry. A length of at least eight characters. What do I need to do to complete enrollment after registration? Provide your name and contact information for the account. This will only be shared with researchers if you allow it in your data sharing, privacy, and access settings. Create your first health profile. Choose your data sharing, privacy, and access settings. Take the EDS Global Registry survey. You will also be asked to complete the Family History Survey. The survey is set up for people to take the survey for themselves or for other members of their family. What is a registry? A registry is a collection of health information about a group of individuals who share a condition or experience. As much as possible, health information is standardized to ensure that information from one person can be easily compared to information from another person. Health information can be obtained directly from individuals or from healthcare providers through a variety of methods: surveys, narratives about a patient’s medical history, document submission, integration of electronic health records, and even sample collection. Depending on the registry, researchers can then examine this information for one or more purposes. What is the purpose for the EDS Registry? The EDS Registry will facilitate medical research for ALL types of EDS, HSD, and associated symptoms and comorbidities. Among these projects is a planned study of whole genome sequences in individuals meeting the 2017 hypermobile Ehlers-Danlos syndrome (hEDS) criteria. If researchers can identify hEDS genetic variants, future studies can then examine patients with hypermobility spectrum disorders (HSD) to determine how often these variants appear in that population. What type of registry is this? The EDS Registry uses a database platform called “Platform for Engaging Everyone Responsibly” (PEER), a community engagement platform owned and operated by the Genetic Alliance, a non-profit leader in health and patient advocacy founded in 1986. How do I know whether I am eligible to participate in the Registry? Participants are eligible to participate in the Registry if they have been diagnosed with any form of Ehlers-Danlos syndrome (EDS) or hypermobility spectrum disorder (HSD) or suspect they may have one of these syndromes. PEER uses branching logic to ensure only eligible participants enter data. Where will my info and data be stored? The EDS Registry data is stored on the PEER platform which is on a GDPR-compliant server that is under password protection in a secure environment. The Registry’s security features meet HIPAA’s security requirements. The system uses Amazon web services with servers located in the United States. How will privacy be protected? The Genetic Alliance and PEER were chosen, in large part, because their database provides people with tools to choose their own data sharing, privacy, and access settings. PEER is a survey-based platform where users can provide data regarding their condition, as well as their family history. The EDS Registry was built using this platform. Who has access to my data? Users decide who has access to their data and how to share any and all information provided in the registry by customizing their privacy settings. Once a user has registered and created a profile, they can review and set these privacy settings using the appropriate activity on their dashboard. With your initial consent, The Ehlers-Danlos Society research staff and medical and scientific boards will have access to your data.The Ehlers-Danlos Society has also partnered with the organizations Face2Gene and the Chiari-Syringomyelia Society for sharing data for future research purposes (as permitted by the participant). To learn more about these organizations please refer to the links: www.face2gene.com and www.csfinfo.org. What does the ability to choose my own data sharing, privacy, and access settings mean for me? When you choose your data sharing, privacy, and access settings, you have the power to decide whether to share information just with The Ehlers-Danlos Society, or with other researchers too. You also have the power to decide whether to just share health information, or if you like, to share your contact information and learn about new research studies. These settings are unique to each individual and their preferences, and can also be changed over time. Can I access and update my data at anytime? You can obtain a download of your data at any time. If you need to add the additional documentation requested at a later date, you may upload this at any time by signing into your profile. If you need to update the data you entered, please contact the Ehlers-Danlos.com registry. Can I participate in other studies based on this data? Users are encouraged to participate in other studies when they meet eligibility requirements for that research study. How long will my data be stored on this platform? The data will be stored in the PEER system until you such time as you may choose to remove your account, at which time the data will be deleted from the Registry. I’m not clear what is involved in being part of the project and would like a bit more info. If you have further questions, please contact us here. What info do I need to provide? How demanding might participation prove? The survey consists of questions ranging from your demographics, health information, diagnosis, and symptoms related to your condition. In addition there will be questions regarding your interest in further research, as well as a separate survey for your family history. The survey can take 30 minutes or more to complete, depending on the information your provide. Would I have to travel? The EDS Registry involves survey-based data collection only. You may participate in the online registry without committing to future travel. Future studies may involve travel for enrollment, but they will generally be conducted in conjunction with EDS conferences to accommodate participants who plan on attending the conference. Will my data be owned by The Ehlers-Danlos Society, the researchers, or someone else? Can it be sold or used by third parties, i.e. universities, consumer groups, medical providers, etc.? You own your data. You can download it—or require it to be deleted from the PEER system—at any time. We will never sell it. We will only share it with your express consent. However, if you do consent to allow your data to be used in a research study, you may not be able to require that research team to delete it from their data, as that could compromise the integrity of the entire research project. If just anyone can sign up, how will this registry be verified? Will there be a requirement for a physician verification of a type of EDS for registration? The survey questions are designed to determine the sources of various elements of information as well as establish diagnostic certainty. Researchers are able to sort and filter the registry data, so they can assess the information in context. At several points, the survey offers the opportunity for the participant to upload letters and reports. While it could be helpful to have trained clinicians complete the Registry for each person, this is not practical from either the availability of trained clinicians or funding. Thus, we have designed the Registry for individuals to complete without professional assistance, intended to maximize accuracy of answers. Finally, registries often serve as a first step in research protocols, to screen people and potentially to invite them to enroll in studies which may involve in-person evaluation. Can I use the registry from my cell phone? Technically you can use the registry from a smartphone with a web browser, but please don’t! The surveys in the registry can be complex, and taking them from such a small screen can be difficult. To help avoid mistakes and protect the quality of the data in the registry, we ask that you instead use a desktop, laptop computer, or web-enabled tablet. Can a relative complete the survey on my behalf? Yes if you are unable to complete the survey or if you are a child under the age of 18 years old, a relative can complete the survey on your behalf. There’s a list of questions that helps the survey-taker explain who they are. Whom should I contact if I have additional questions? Please contact us through the EDS Global Registry Contact Form. When participants enroll in PEER® (The platform for the EDS registry), they receive a written information notice explaining PEER’s consent process. Following account creation, individual PEER participants then start with a set of default data sharing and access recommended by the registry sponsor. After reviewing these settings participants can choose to accept the defaults or customize, and if participants do choose to customize, they can choose to do so on their own or with the help of a community guide. Each community guide provides recommendations for three different levels of privacy concern: one for individuals with low privacy concern, and two more for individuals with moderate and high privacy concerns regarding privacy and/or accessibility of their information. Graphics are used to assist participants in identifying how their concerns about privacy relate to those of community guide. PEER’s consent system provides separate privacy settings for each entity with which the participant might share information, with separate choices of “Allow, Deny, or Ask Me” for each entity for viewing data anonymously, exporting anonymous data, or viewing/exporting data with name and contact information. PEER is owned and managed by the Non-Profit, Genetic Alliance.